Acadian Genealogy Homepage; Acadian Women! "Acadian Women Lose Their Heads Over Religion"
Over two centuries ago the French Revolution started with great hope, and ended with great horror, during the reign of THE DIRECTORATE. These events were experienced by many of our Acadian cousins following their expulsion from Acadia. This is a story of two Acadian women from that time. Obviously this is an old story but a new one to me. The victims of this story are Anne Prince [Le Prince] born abt. 1721 (according to Stanley LeBlanc, abt. 1724) in Pisiguit married Sylvain Leblanc, born about 1721 in St. Charles-des-Mines, Grand Pre, Acadia. They said their vows in Pisiguit abt. 1743. Their union was blessed by at least four daughters, Marguerite 1748, Marie 1754, Anastasie 1755, and Marie-Modeste 1761 (?). 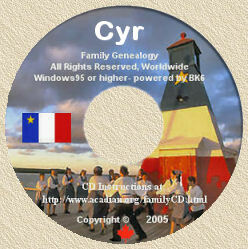 We know the family lived in the parish of St.-Charles-des-Mines, in Grand Pre in 1745. In the fateful year of 1755, 1500 Acadians were loaded onto ships bound for Virginia. Virginia, The Cradle of Liberty, refused these poor wretches. They remained at anchor off shore for some time, with inadequate food and poor hygiene. Many died. Eventually, in 1756, the surviving 1,226 were shipped to England. A group of 340 left for Southampton, 300 to Bristol, 250 to Penryn, and 336 including Sylvain Leblanc's family to Liverpool. The voyage was arduous. Two vessels sank, losing all passengers and crew. The refugees in Liverpool were housed in old pottery works. Sylvain Leblanc died in Liverpool in abt. 1756. After the signing of the treaty of Paris 10 February 1763, the surviving 866 Acadians in England were free to leave. There were 224 in Liverpool, 219 in Southampton, 184 in Bristol, 159 in Penryn. Another 80 men were forced to serve on the ships of privateers. On 7 June 1763, the Acadian prisoners from Liverpool boarded the schooner l'Esturgeon for France. They sailed to Morlaix in Brittany, and were warmly welcomed. The Mayor and the Chief of Police found them housing and jobs. They were given a stipend and their children were provided with free schooling. The people of Brittany spoke the Celtic tongue, very similar to Welch. Nearly thirty years after their arrival in France some Acadians were still receiving help from the state, including Anne and her daughter. They were unable to support themselves completely with the sales of their knitting. Genealogist will be eternally grateful to Jean Leblanc of the village of Bernantec in Brittany. He told the authorities that Sylvain Leblanc, born in Bassin des Mines in 1719, married Anne Prince in Pisquit, the parish of l'Assomption. She was the daughter of Antoine Prince and of Anne Trahan. He said that Sylvain LeBlanc died in Liverpool in 1756. He indicated that Anne Prince was living in Morlaix with her family. During the DIRECTORATE, the laws were very hostile to religion and clerics. Because of the tragic wars of religion, that raged for many years before the Revolution there was strong anti-cleric sentiment in most of the population. The DIRECTORATE decided to ban all religion, but permitted belief in a deity. l'Abbe Augustin LeClech refused to bend to these new rules. He became a fugitive and sought shelter with charitable people. Tired of playing hide and seek with the authorities, with the help of a nephew, he set sail for England, 19 June 1779. Because of a heavy sea they turned back and gained the shore of Brittany several kilometers to the northeast of Morlaix. Traveling on foot to Morlaix, he reached the home of the widow Anne Prince and her daughter at 97 rue des Vignes. They had a guest, 24 year old Marie-Martha Levron, an Acadian relative. L'abbe LeClech requested concealment in their home. The three women hid him on the upper floor of their residence. Later that night Anne Prince, her daughter Anastasie Leblanc and their guest, heard a knock. It was two town officials saying they came by to determine their need for assistance. Once in the house they soon found the cleric and arrested him and the three women. Two days later, the local authorities sent the four prisoners sixty kilometers to Brest. They arrived there on 23 June 1779, on the eve of Saint John the Baptist's Day. That day was a cherished holiday of our ancestors for thousands of years after Christ. They were locked in the Castles dungeon. A tribunal found LeClech, Anne Prince and Anastasie Leblanc guilty of defying the laws of the Revolution. Marie-Marthe was acquitted for lack of evidence. Those convicted were sentenced to death by the guillotine. They were executed 3 July 1779 (Note from Yvon: my research indicates the date of their execution was July 01, 1794). First l'Abbe LeClech, then 74 year old Anne Prince and finally 49 year old Anastasie Leblanc (Note from Yvon: my research indicates she would have been 39 years old). Thus three martyrs entered the history books. When calmer times returned under Napoleon, women with guillotined relatives, adopted the fashion of wearing a ribbon around their necks, at the usual point of severance by a guillotine. So ladies if you feel a special degree of kinship with these women you may want to do the same. The above noted is a re-print (with thanks) of article written by Florian Bernard in the February 1997 Issue No. 27 of the "Heritage Acadian" and provided by my good friend, Wally Marcou [[email protected]]. Yarmouth Vanguard, Tuesday, September 5, 1989. The 200th anniversary of the French Revolution brings rejoicings for some people, sorrowful memories for others. For the Acadians, it brings to mind that tow of their kindreds, Anne LePrince and her daughter Anastasie, were put to death, at the time, for concealing a Catholic priest. Anne LePrince was born in 1713 (Note from Yvon: my research indicates her date of birth was abt. 1721) in Windsor, N.S., then called Pisiquid, the daughter of Antoine LePrince and of Anne Trahan. It was here also that she married, around 1743, Sylvain LeBlanc, born in 1719 (Note from Yvon: my research indicates his date of birth was also abt. 1721), the son of Jean LeBlanc and of Jeanne Bourgeois. Very shortly after the birth of their daughter Anastasie, in 1755, which took place also at Pisiquid, they were expelled to England, where Sylvain LeBlanc died the following year (abt. 1756) in Liverpool. In 1767, we find Anne LePrince with her family in France, at Morlaix, in the Department of Finistere, Brittany. She was still living there with her daughter Anastasie in the evening of June 19, 1794, when the abbe Augustin Le Clec'h knocked at her door to beg refuge. The clergy of France had been summoned by the revolutionaries to take the oath to the Civil Constitution of the Clergy, which stated that the clergy of France was independent from the Holy See. February 6, 1791, the abbe Le Clec'h refused publicly to take the oath. Unfortunately the pastor of the parish where he was took a different stand. In order to conform himself with the Pope's edict which forbade all relations in religious matters with anyone who had taken the oath, the abbe Le Clec'h declared on October 2 of the same year that from then on he was "to sever all cultural relations with the constitutional pastor of the parish." This was for him the beginning of a rugged nomadic life which was to last nearly three years. His lot worsened as new penal laws were enacted against those who had refused to take the oath. Then came the famous law of August 26, 1792, whereby all priests who still refused to take the oath were to leave the country within 15 days, under the pain of severe sanctions. After having met with great many hazards and escaped many perils, he at length succeeded, around the end of spring, 1794, with the help of a nephew, to board a boat which was to take him to a sloop sailing for England. Unfortunately, rough seas compelled him to turn back. He landed on the shores of Brittany, about thirty miles north east of Morlaix. In spite of the distance, he immediately decided to walk here. He arrived at the home of Anne LePrince around ten o'clock in the evening. The abbe Le Clec'h and Anne LePrince were complete strangers to each other. However, a sister of the abbe Le Clec'h was subprior at the convent of the Carmelite Sisters of Morlaix, where Marie-Modeste LeBlanc, daughter of Anne LePrince, had made her profession in 1788. The arrest of the abbe Le Clec'h was to take place the very next day. In fact, on the evening of June 20, around six o'clock, two agents of the Municipality of Morlaix arrived at the home of Anne LePrince, who was listed as a needy person, for the sole purpose of inquiring abut her welfare. Anastasie, thinking that these agents had come to arrest the abbe Le Clec'h, hastened to warn the priest, who was hiding upstairs. The agents, perplexed, followed her and found the priest. He was instantly taken as prisoner and brought, along with Anastasie, before the Directory of Morlaix, which was a body of five men with executive powers. In order to have enough evidence of guilt, the municipal authorities sent four officers to perquisite the home of Anne LePrince. They found articles that could have belonged to the abbe Le Clec'h, also many objects belonging to the Carmelite Sisters. The investigation at the house being completed, legal seals were affixed to the doors of every room and Anne LePrince was taken as prisoner. A report was drawn up without delay. This made it possible for the Directory to start questioning immediately the abbe Le Clec'h. The examination lasted three hours, until about one o'clock in the morning. Due to the frankness of the answers of the abbe, the Directory, next day, June 21, issued an order by which he was to appear before the Revolutionary Tribunal of Brest, some 60 kilometers from Morlaix. Anne LePrince and her daughter Anastasie were to be taken there with him. Arriving at Brest on the 23rd of June, the prisoners were immediately confined to the prison of the Chateau. The trial was set for July 1. The attorney general for the Revolutionary Tribunal of Brest was an unfrocked religious priest, 58 years old, who had madly thrown himself into the Revolution. In those revolutionary days, to be accused meant practically to be condemned. The verdict, which was imposed immediately after the cross-examination, contained the following clauses: "The Tribunal ordains that the said August Clec'h shall be delivered to the executor of the criminal cases to be put to death according to articles ten (etc.). Sentences Anne LePrince, Anastasie LeBlanc, her daughter, to die according to articles 2 and 3 (etc.)". The trial had opened at eight o'clock in the morning of July 1, 1794. At noon on the same day, the abbe Augustin Le Clec'h, 55 years of age, Anne LePrince, 80, and Anastasie LeBlanc, 38, ascended the scaffold erected on the square called "Triomphe du Peuple", on the common of Brest, to receive the palm of martyrdom. And thus another judicial assassination was consumed in innocent blood, the victims having been found guilty of having accomplished their most sacred obligations up to the end. The wish that comes naturally to one's mind at this moment is that these martyrs may some day be raised by the Church to the honors of the Altar. It would be one of the greatest glories of the Church of Nova Scotia. It would also be an aureole for the Acadian people. died around 1761. His family was at Morlaix, France, in 1767. A footnote says that his wife Anne LEPRINCE was a martyr of the French Revolution. She was guillotined 1 Jul 1794 with her daughter Anastasie and the abbe Clech. reprinted from MACLEAN'S MAGAZINE, Toronto (15 Dec 1950). three daughters were then sent to Morlaix, France. The youngest, Marie-Modeste, became a Carmelite nun at Morlaix with the name of Sister Augustin de Saint-Francois de Sales. Anne LEPRINCE and her oldest daughter Anastasie LE BLANC were put to death on the guillotine on 1 Jul 1794 during the French Revolution (Reference: Aime' Guillon, LES MARTYRS DE LA FOI PENDANT LA REVOLUTION FRANCAISE; Paris, 1821; vol. III, p. 489).